I live in Hamburg, North Germany, and I am planting a heritage English orchard. I am looking for two varieties of pear which were bred by Thomas Rivers, but not Conference. Ideally, I would like one to eat ‘off the tree’ and one that would keep for a short while. My soil is on the sandy side with woodland on the North and East side, but with a high water table (4 meters below ground level). In the very worst of the winters we can get below -12c. Spring arrives at a similar time to the UK Midlands and is as variable! Thomas Rivers (1798 -1877) did not breed many pears, as far as one knows, and, indeed, it seems only one. He raised a great many more varieties of stone fruit – plums, cherries, peaches and nectarines. It was his son T. Francis Rivers (1831-1899) who raised the Conference pear and also Fertility and Beacon. Summer Beurré d’Arenberg was probably raised by Thomas Rivers; it first fruited in 1863, a decade and more before his death. This ripens during September in southern England, so not really as early as the name suggests. A juicy, melting fleshed pear with a lively, sweet-sharp taste, it crops heavily, although this can result in rather small fruit. 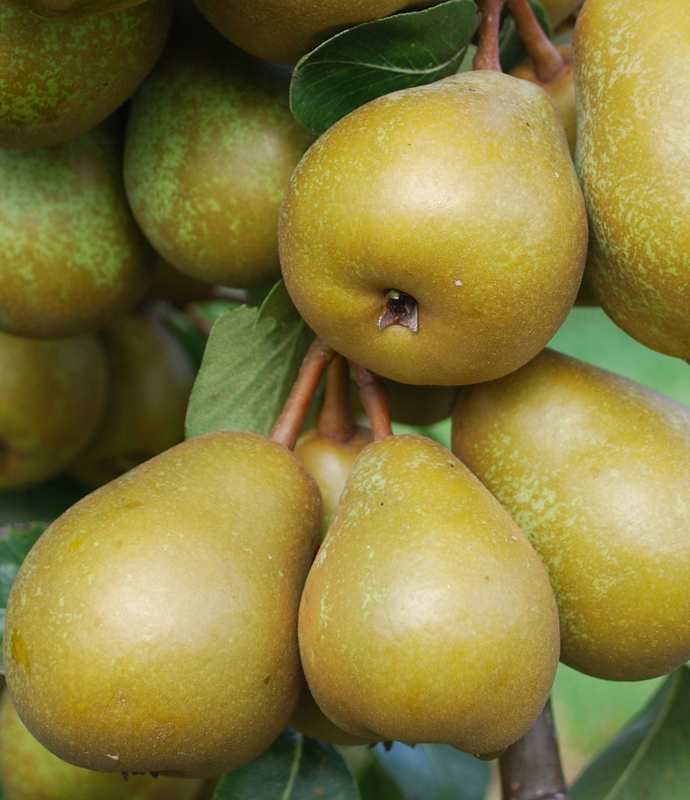 For another pear from the Rivers Nursery, you will need to turn to those raised by his son. Beacon ripens during August, keeps only for a short time and crops heavily. Fertility is a September to early October pear, with melting flesh, sweet and lemony; it can be on the sharp side, but lives up to its name producing prolific crops. (For pictures see www.thebookofpears.fruitforum.net) They all flower around the same time as Conference, or just a little later, and in the mid-period of pear blossom time. All these varieties of pear are growing and conserved in the National Fruit Collection at Brogdale in Kent. Scion wood – graft wood and bud wood – for propagating your own trees can be obtained from the National Fruit Collection: click here. This is probably the best way for you to get these pears, although they could be worked for you by a nurseryman in England and then sent on to Germany.